Fujitsu’s roadmap for 2012 has been leaked, and it looks like a busy year for the Tokyo based tech company. Perhaps not as well-known as it should be in the US, Fujitsu is the third largest provider of IT services when measured by revenue. Its right behind IBM and Hewlett-Packard. Roadmaps are a plan for the future and certainly not set in stone. But what Fujitsu is planning is quite interesting. As you can see in the image below, they have two new ultra books due out in May. In June they plan to launch a ‘Mainstream Android Media tablet’. That tablet could be the Fujitsu Arrows Tab they showed off at the CES in January. There will also be a ‘Mainstream Slimbook for Channel’ planned for June. 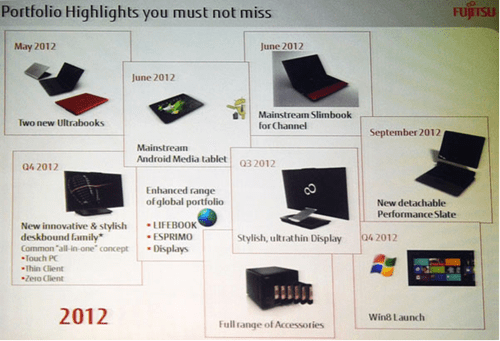 There is also an all-in-one PC, a new monitor, and a few other items planned for 2012. But the one that is most eye-catching is planned for September of this year. They simply refer to it as a ‘New detachable Performance Slate.’ It appears to be a tablet with a detachable keyboard, something along the lines of an Asus Transformer. A convertible tablet/laptop. As they refer to it as a ‘Performance Slate’, we would expect it to be a fairly powerful machine, perhaps with a quad core processor and respectable amount of memory. We’ll keep you updated here at CP as more details come in – and let you know when they come to market..